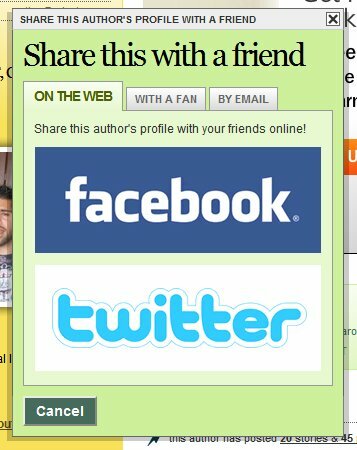 Just a quick note to let you guys note that I’ve enhanced the “Share” tool you see on stories, pages and author profiles with some new functionality. I’ve added a new tab that’ll allow you to share the page you’re looking at directly on Facebook or as a new tweet on Twitter, if either of those sites tickles your fancy. This entry was posted in General, Site mechanics, Site updates and tagged facebook, Features, share, sharing, social networks, tools, twitter. Bookmark the permalink. I have to admit, though, I liberally borrowed this from Digg’s latest change to “Shouts”. I still like the idea of sharing with fans, but I thought it’d be handy to be able to directly share stuff on Facebook or Twitter and let the site fill in the blanks for you. I think pretty soon, the internet is going to be just one big giant website, and one login is gonna getcha everything. Are you thinking of adopting OpenID at all? Yeah, I’m looking at OpenID / OAuth and Facebook Connect down the line… probably gonna be a little while before I get to that, though.